The Iraqi prime minister has hailed the sentencing of Saddam Hussein to death by hanging for crimes against humanity as "a verdict on a whole dark era". Nouri Maliki said he was a criminal who deserved the punishment he was given. The former Iraqi leader was convicted over the killing of 148 people in the mainly Shia town of Dujail following an assassination attempt on him in 1982. US President George W Bush said the verdict was a "milestone" for Iraq but the EU urged it not to execute him. Saddam Hussein and his co-defendants will be given the right to appeal, but that is expected to take only a few weeks and to end in failure for the defendants. According to the BBC's Mike Wooldridge, several doubts have also emerged over how soon the sentence can be served. Iraq's President Jalal Talabani, one of two people who must authorise the death sentence, is known to oppose the penalty. Moreover, some legal experts have argued that Saddam Hussein's ongoing trial for atrocities committed against the Kurdish population should be allowed to reach a verdict before he is executed. At present, there are no plans to delay the former leader's execution in order to complete his second trial. In Iraq celebrations broke out among Shia Muslims, but Sunni areas saw protests and some clashes. Almost three years since his capture, soaring sectarian violence has brought Iraq to the brink of civil war - and correspondents say few Iraqis think the trial verdict will ease the conflict. The deposed Iraqi president denounced the court, the judge and the US-led occupation force during his sentencing in Baghdad. 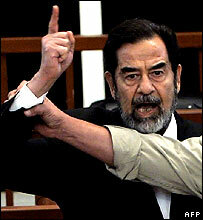 As the judgement was delivered, Saddam Hussein shouted out "Allahu Akbar!" (God is Great) and "Long live Iraq! Long live the Iraqi people! Down with the traitors!" Mr Maliki welcomed the conviction in a televised address, saying it did "not represent a verdict for any one person", but "a verdict on a whole dark era... unmatched in Iraq's history". "Maybe this will help alleviate the pain of the widows and the orphans... and those who have paid at the hands of torturers," he said. President Bush called the verdict a "milestone" in the efforts of the Iraqi people "to replace the rule of a tyrant with the rule of law". But the EU called on the Iraqi authorities to work for reconciliation and refrain from carrying out the execution. The Vatican joined several human rights groups in attacking the sentence, described it as a legacy of "eye for an eye" vengeance. Shortly after the verdict there were jubilant scenes in the Shia district of Sadr City, and in the holy city of Najaf. But in Saddam Hussein's hometown Tikrit there was fury, as supporters of the former president defied a curfew to parade with photographs of their hero. The Baghdad court also passed death sentences on Saddam Hussein's half-brother Barzan al-Tikriti and Iraq's former chief judge Awad Hamed al-Bandar. Former Vice-President Taha Yassin Ramadan got life in jail and three others received 15-year prison terms. Another co-defendant, Baath party official Mohammed Azawi Ali, was acquitted. Many critics have dismissed the trial as a form of victors' justice, given the close attention the US has paid to it. Saddam Hussein's defence team have also accused the government of interfering in the proceedings - a complaint backed by US group Human Rights Watch. The process was marked by frequent interruptions by defendants and their lawyers and problems with security. And the former leader's lawyers have attacked the timing of the planned verdict, which comes days before the US votes in mid-term elections. Mr Bush's Republican Party is at risk of losing control of Congress, in part because of voter dissatisfaction over its handling of the Iraq conflict.